On Friday, March 31, 2017, Caldwell University presented its annual Veritas awards, recognizing alumni professional excellence. At the dinner, Caldwell Dominican Sister de Montfort Kinchellagh was honored as the recipient of the Excellence in Social Justice Advocacy award. Throughout her years of ministry, Sister de Montfort has “worn many hats,” including those of teacher, principal, Supervisor of Schools, and Assistant Superintendent of Schools for the Archdiocese of Newark. A tireless advocate for peace and justice, she also served on the Caldwell Dominicans’ Leadership Team as a Councilor for Ministry. Sister de Montfort worked to establish the congregation’s Commission on Global Issues (CGI), which seeks to draw attention to human rights needs at home and abroad by focusing on trafficking, migration/immigration, peach and security, and climate change. 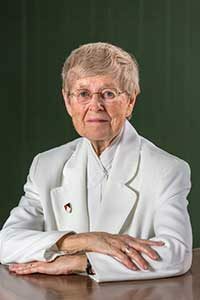 Sister de Montfort served as the CGI’s chairperson for more than fifteen years and as the congregation’s Justice Promotor for thirteen years, keeping the Caldwell Dominicans actively advocating for human rights and the plight of the poor and marginalized. In her “retirement years,” Sister de Montfort has continued her advocacy work within the Dominican Sisters in Committed Collaboration (OPSCC) in conjunction with First Friends of New Jersey and New York, working diligently to “uphold the inherent dignity and humanity of detained immigrants and asylum seekers.” As one the coordinators for First Friends’ Stamp Out Despair program, Sister de Montfort continues to gather donated pens, paper, envelopes, ‘Forever’ stamps, and phone cards so that detained immigrants and asylum seekers have the resources to communicate with loved ones. Sister has received several honors including the 2008 Dominican Sisters Peace Award recognizing her leadership and service on justice and peace issues as well as the 2003 West Essex Chamber of Commerce Profile in Excellence acknowledging her countless leadership roles.